What a beautiful home! We were blown away by the attention to detail in The Victoria. Another gorgeous John Cannon Home! All I can say is: wow! 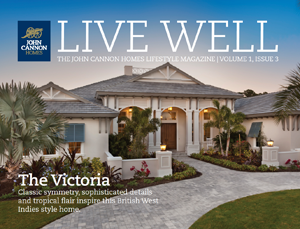 The British West Indies come alive in this spectacular John Cannon Home. Our review is nothing but glowing! We love it! If I lived in this home I would never want to leave. A masterpiece, truly. Oh my! It's clear why this model was chosen to be on the cover of the Parade of Homes magazine. Even more gorgeous in person! Our new favorite John Cannon Home by far. A perfect amount of living space; not too large but still feels grand and luxurious. The water out back is so tranquil. We loved the previous John Cannon Akarra model but this one takes the cake! The attention to detail on the exterior is just unbelievable. We really enjoy the design and architecture of this home. Our favorite home in the Lake Club!!! We will be back to see this one again soon!